05/10/03: Follow the users talks. Real time broadcast!. User=username. Leave the password blank. 05/10/01: Flavio Pescuma's talk has been canceled. Balazs Scheidler will do it instead. Check the users talks section. 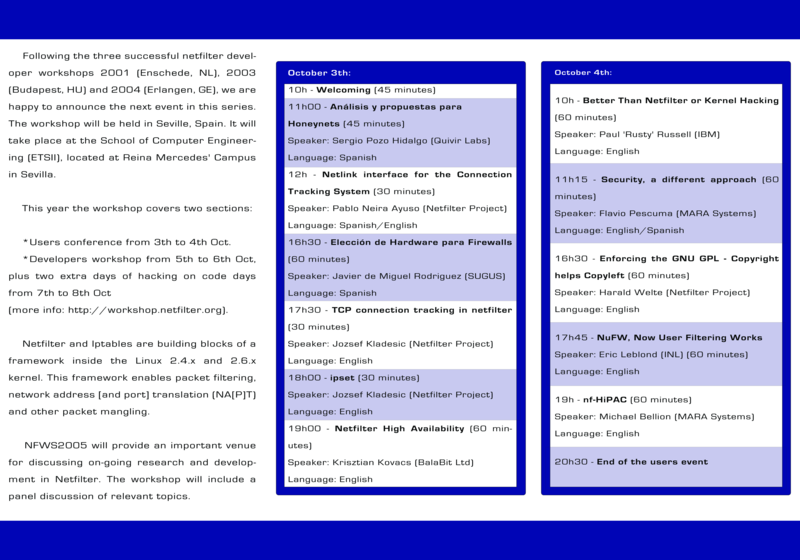 05/09/30: The leaflets about the workshop and the user talks are available by clicking here and here. Added the developers workshop schedule as well. 05/09/26: Added the user talks schedule, check it out. 05/09/25: Astaro AG, following the tradition of previous editions, is sponsoring this year's workshop. 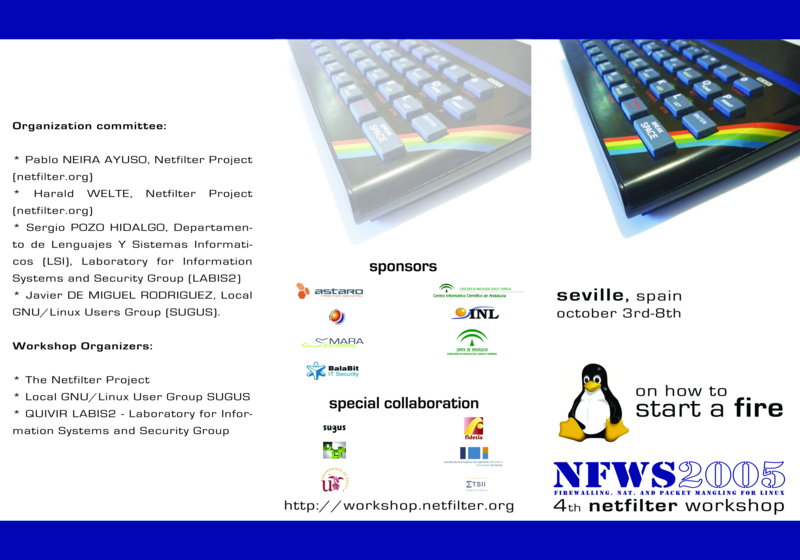 05/09/20: Click here to download the poster of the 4th Netfilter Workshop (1.1MB). 05/09/13: The Consejeria de Innovacion, Ciencia y Empresa and the Centro Informatico Cientifico de Andalucia has become sponsors. Muchas Gracias. 05/09/06: MARA Systems has decided to join the netfilter workshop sponsorship policy. Thanks a lot. 05/08/30: Merci Beaucoup! INL, the french company that develops NuFW, has become sponsor. 05/08/29: Good news! 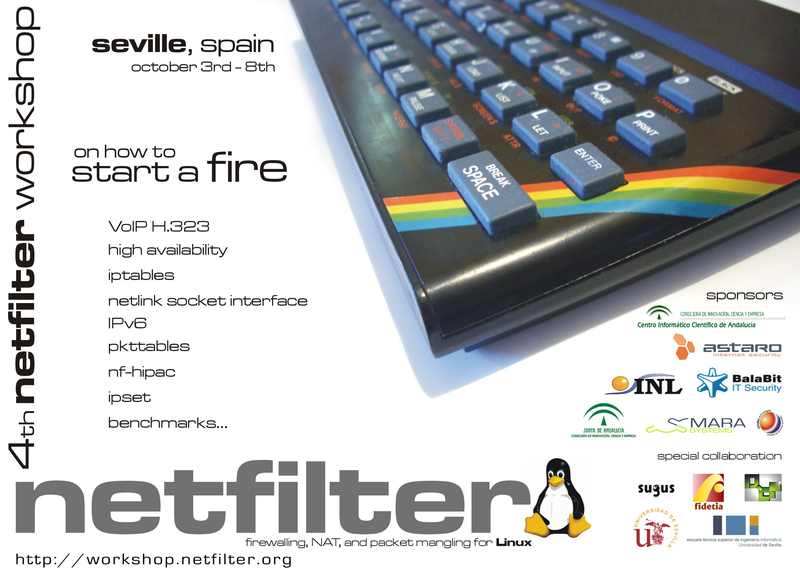 More sponsors: Optima Technologies, an Andalusian company settled in Seville has become associate sponsor of the Netfilter Workshop. 05/08/18: BalaBit IT Ltd. has become associate sponsor of the Netfilter Workshop. Thanks a lot! 05/08/01: Netfilter Workshop web site set up! More info soon.